When members of the Trident want to rain death from afar, they get behind the muscle cylinders of one of these bad boys. Many a chub have fallen to it's long range cannons and it's heavy armor plating have made it a very difficult asset to remove from the situation. Both of these guys are based off of Squieu's awesome mini-frame. 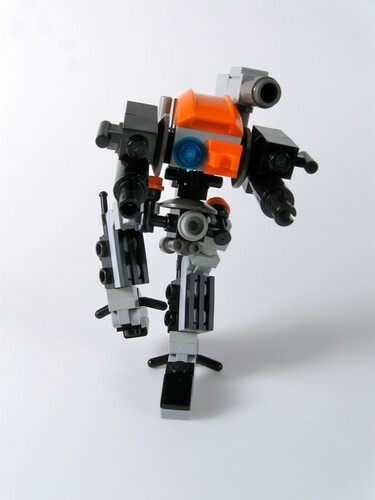 Over the past few days there have been a number of other blogs that have popped up dedicated to MFZ in one way or another. I've added them to the links section to the right but I figured I would briefly go over them here. 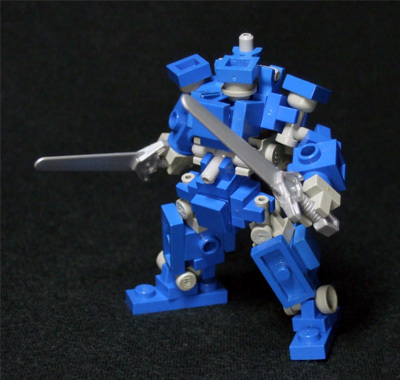 Zeekhotep's Mechaton/MFZ blog. He's been around for quite some time and has the only blog still active that was around during the early stages of Mechaton. He;s got some awesome stuff up there if you dig around, including build breakdowns, battle reports, etc. Another older blog with not as much activity on a regular basis, but he's got a number of frame designs in LDraw format as well as part lists and breakdowns of some older stuff too. Mantisking's blog which popped up about the same time as mine. He's got some great breakdowns of some standard builds done by Soren as well as a look into some community activity. An effort to convert the Game of Thrones universe over into MFZ. Another guy who, like myself, is creating his own setting to fit within MFZ. 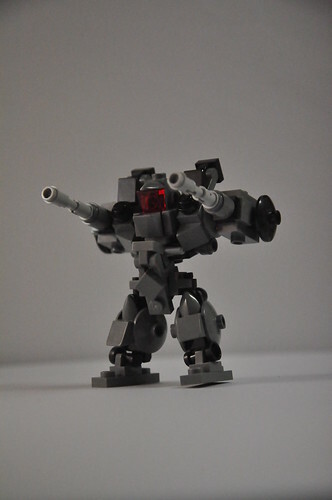 MFZ fan run forums. Lots of good stuff going on there! Do yourself a favor and check them out! My Pick-A-Brick order finally arrived in the mail, and as you can see I went with some of Squieu's mini-frames. These guys are so much better than I had hoped! the build is really solid and there is so much detail in such a small space. If you're trying to decide on what kind of frames you want for your own squad, I really can't recommend these frames enough. I'm going to be customizing and equipping these guys over the next few days. I'll post the results once I have them! "Rattler One this is C&C, we've got reports of a resistance cell relocating a protein silo over on the west side of the canyon. King Cobra wants you to check it out." "Affirmative C&C, Rattler One on the move." The UMFL, unlike other union forces, does not consist of citizens of the Sol system. Among their ranks are those who settled the colonies and instead of living a life of starvation and poverty, signed on the dotted line to become military. Companies of "space farmers" turned frame jockeys are the hand of the Union among the colonies. The Serpent Legion is the chosen elite of the UMFL, hand picked by the ranking members of the Legion. Every member of the steadily growing force has done something to distinguish themselves from the rest of the peasants populating the ranks of the UMFL. Some overcame incredible odds in battle. Others were ruthless in the pursuit of their mission objectives, sacrificing anything that wasn't mission critical to get the job done. Some were outright insane, charging headlong into battle with reckless abandon. Incredible technical aptitude, a mind for tactics, a keen and suspicious eye, every one of these people has a place with the Serpent, it's just a matter of where. Every candidate is tested rigorously and placed into a role where his or her particular talents will be put to the best use. It takes on average about 4 months for a potential candidate to go from the first rounds of testing to the first day in their new position. During this process they are given the best training money can buy, and access to some of the most advanced gear available. The Serpent has their own "skunk works" division as well, continuously working on improving and developing weapon and frame designs. Their most recognizable contribution to the Legion is the ST-07X Stealth Chub. The Stealth Chub is completely covered in a rubberized radar absorbent material and has especially designed systems that generate next to no noise (as far as an 18ft tall walking tank is concerned anyways). They are primarily used in small squads which support the main bulk of a company from superior positioning with either long range support fire, targeting information, or hit and run harassment. Any Orion Militia will tell you when the Serpent's head comes over the horizon, you best find somewhere safe. The second installment of "Under the Hood" has a few more frames to have some fun with. This is my favorite frame at the moment. Nearly every piece on the thing can be expanded, changed out, or used for some detailing. It's poseable, looks sweet, and is sturdy to boot. Sqeuieu has some cool variations in his brickshelf gallery, and (please excuse the self-promotion) I've got a few designs as well. The only real downside to this frame that I can see is that it requires 7 of those four stud 1x1 bricks, which are some of the pricier pieces to buy in large amounts. There is an LDraw file of this guy available on Divnull as well. These guys are pretty sweet. A very well built and unique frame compared to most of the other guys around. I love the reverse legs and all the potential the torso has. Here's a variation by Jed September that I absolutely love, and here's a company of hi-leg badboys with a commisar by Soren. Aaaaaaand here's the breakdown shot of the torso for all you would be Hi-leggers. While this one is quite new, I really love how it has the feel of a commisar on steroids. 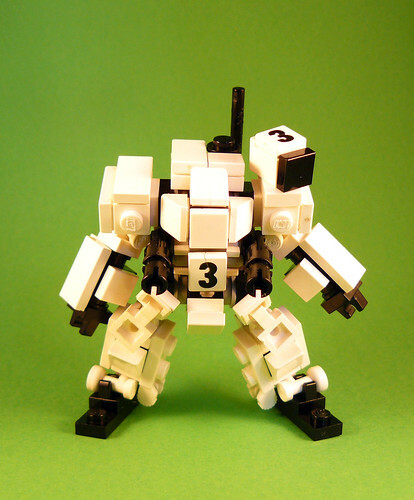 Triple-ought has a few variants as well as a breakdown shot of his build. I can't wait to see what the rest of the community does with this guy. Much like how car companies take someone else's parts and slap a new body over it, a lot of the custom builds that have shown up have someone else's core designs under the hood. Here's a quick rundown of some of those core designs. The Chub is by far one of the most popular and most mod-able frames out there at the moment. If you were to strip it down to it's bare essentials it's got lots of space to build off of, looks great, and is pretty damn pose-able too. Ironsnpier has a wonderful variant here. Joshua Newman has a killer reskin here as well. Both the Conscript and Commisar are very similar builds and you probably wouldn't even notice the difference between the two at first (I know I didn't). It's another sleek looking frame from Soren with a lot of modding potential. Those arm or leg pieces can easily be swapped out with studded bricks and the backpack potential is near unlimited. You can get the LDraw file over at Dinvull. Dr Watsman has done quite a bit with this design as seen here, here, here, and here. 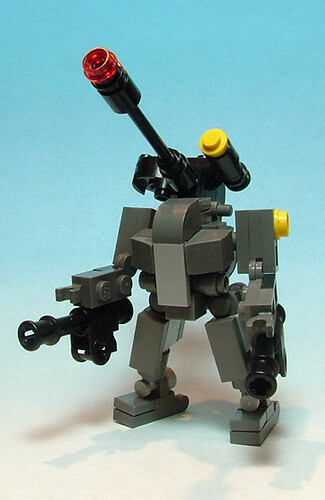 An older, but very versatile frame originally designed for Mechaton. It may not be as pretty as some of Soren's stuff, but oh man this guy is a modder's dream. Jed September has countless variations of this guy as well as a few breakdown shots, this one is by far my favorite. You can also get the LDraw file for this one over at Dinvull. So, the other aspect of this blog other than talking about MFZ is the setting and story that I am creating in the MFZ universe. Here's a brief rundown of what I have in mind. The year is SC 0245, the planet: Orion 6. Rich in valuable minerals and ores, the arid planet became an important target for the SU to control. Shortly after the riots on Quall in 0240, the colonists of Orion 6 rebelled, attempting to force the UMFL presence out of the system. UMFL forces in the system viewed these uprisings and terrorist threats to the Union and hardened their resolve to eliminate the threat. The conflict continued to rage for years with neither side gaining a significant advantage. The Federation stepped in and offered the colonists of Orion 6 to join with them, but they refused. They didn't want to be part of any larger government, they just wanted their independence. The Federation agreed to open trade with the colonists as an independent, bringing the colonists needed supplies and rations in an otherwise barren environment. You may notice some similarities to the current/recent situation in the middle east, which is not completely coincidental. Where it gets interesting though, is where the Ijad come in. Since the people of Orion 6 have no desire to be a part of a larger government, the Ijad have found themselves more respectful of the colonists of this world. In fact, some Ijad have been willingly taken on by human hosts on the colony, creating a symbiotic relationship and in a sense a new "race." The fiction aspect of things will focus on the conflicts between the Serpent Legion and one of these warbands, the Trident. I feel there is a lot of room within this framework for some wonderful storytelling and some really badass events. Let me know what you think! First thing's first, if you're going to play a mecha tabletop game you're going to need some mechs right? While there are some "default" builds that will be available in the rulebook when it releases, most people will be (and already have been) creating something of their own. I wanted to take a moment and go over some of the more prominent people who have been putting up their designs over at Flickr. Jed has some wonderfully solid builds and very clean composition. 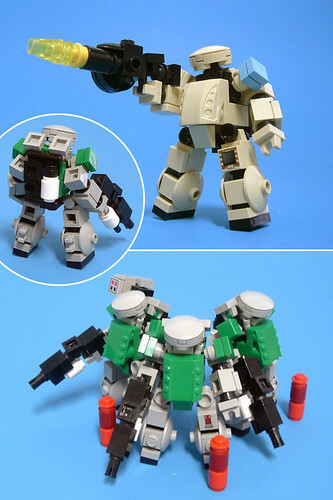 Soren is the official designer for MFZ, and for good reason. Everything he puts together blows my mind in one way or another. Some very nice Commisar based frames and very clean color shcemes. This one is my personal favorite. 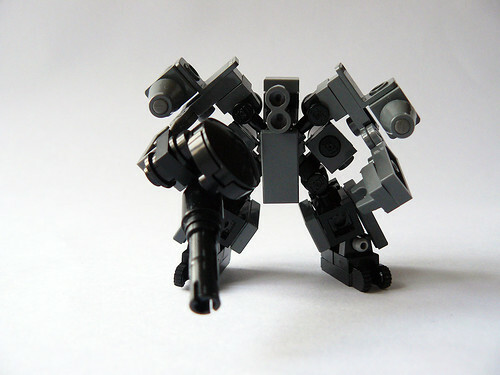 A really cool style, and how can you turn down a mech with a chair for a chest? Not much MFZ related yet, but everything there is awesome! There's plenty more around, and this list is by no means complete. There are a ton of other great builders and I encourage you to take some time and look through them! Over the past few weeks, Kickstarter has been fundamental in getting things moving for an indie game called Mobile Frame Zero: Rapid Attack. With the help of a small but strong community and a little help from Penny Arcade, Kotaku, and a certain ensign of Star Trek fame, things rapidly got out of control. It didn't take long for the backers to come pouring in, quickly bringing funding beyond 400% of the goal. 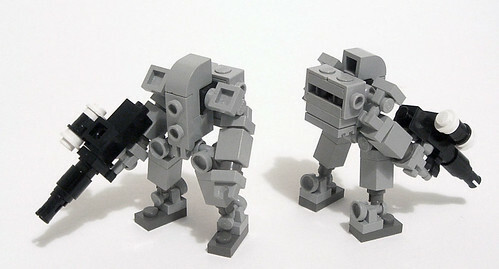 Needless to say, a game involving legos, mechs, and classic tabletop minis gameplay has my interest. But this is looking absolutely phenomenal. 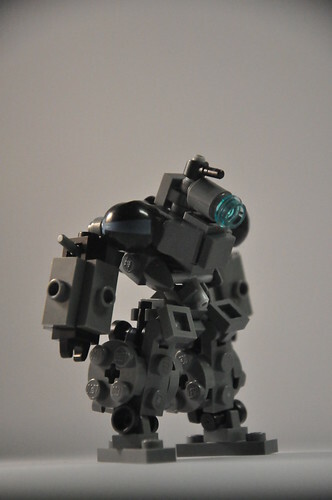 There is a large group on flickr showcasing some of the amazing lego mechs (or frames) being designed and used for the game. I highly encourage you to check it out if you haven't already. Enough history! On to the blog! I'm going to be blogging about the game (strategy, builds, etc.) as well as creating a setting of sorts to fit within the universe Josh and company have created for MFZ. There will hopefully be some short fiction involved at some point as well. This campaign of sorts takes place on the planet Orion 6 (hence the name of the blog) and will showcase the conflict between the UMFL and the Free Colonies. I'm really excited to get things moving, and I hope you join me for the ride!